In between trying to really challenge myself by taking on as many projects at once, I have had a few minutes to sit down and actually get back to my I Heart Paris book, part of the I Heart book series. I have finished the first two and on the third book now. If only there was more time in the day as I really want to finish the series before I go to America. As part of my secret guilty pleasures, I watched Made in Chelsea. Shhh, don’t tell anyone. It’s the only English show I have ever watched. There is something about it’s awkward silences and too posh accents that keeps me intrigued. This week I was rooting that the rumors weren’t true about cheating Alex! All I will say, in case you haven’t had a chance to catch up, is I hope Binky’s Momma annihilates him soon! As I went through a flashback to share Missy Moo’s birth story, I came upon this video of her only hours old and snoring. I have never laughed so hard in my life that such a noise could come from such a tiny new form of life. At the time I was worried that something was really wrong but the midwife assured me it was normal and would go away. On my new eat healthier, drink healthier, be healthier 2014 challenge, I have been having smoothie boosters for breakfast each morning. It helps kick start my metabolism and really starts my day making me feel good. Click the picture for the recipe. Anything can be thrown in, so you can have a different flavor everyday. I am completely obsessed with #littlebird from Mothercare. 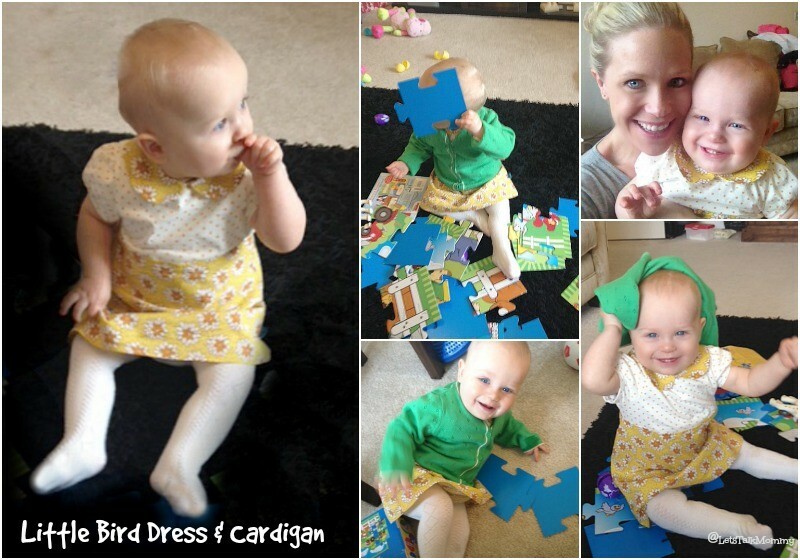 I bought this gorgeous dress for Missy Moo for the summer along with a thin green cardigan. I loved it online and even more when I put it on her. So I have gone back and bought a few more from the brand for our upcoming vacation to America. It was the first time I have ever bought clothes from Mothercare and I have to say won’t be my last. I am so very excited to share that I have made the SHORTLIST for the BiBs for FRESH VOICE!!! I can’t believe it. I never thought in my first year so many amazing things could happen for Let’s Talk Mommy. I am so very honored and grateful to be among so many great bloggers who I admire so much. If you have a moment would love you to vote for me! Thank you ever so much. I am thrilled and nervous but still on cloud 9 about it all. I know it freaked me out at first but now its hilarious. I adore Missy Moo’s dress! Little Bird is such a cute range, I wish they stocked it at our local Mothercare. I know, I just buy it online. Wish it was in my size. Thank you Morgana, you are so lovely and supportive. Couldn’t have got there without you!!! That little dress is so cute, love it. I know poor poor Binky!!! Grrr on men! Does anyone not cheat on that show!! Thank you so much for the congrats. I am still on Cloud 9 !!! Ahh, i do love that clothing range, it’s a bit vintage with a modern edge, & they have a lovely range of colours. Lovely post and wow your little girl’s snoring made me lol-so funny! Healthy eating makes the world of difference huh! I LOVE MIC too! Ahhhh thanks hunny. Hahaha it was so funny. Even louder in person. I am just starting out but it does make a difference. Thank you so much Amy. I am so thrilled and grateful. Definitely one for the 18th birthday. Thank you hunny so much. I couldn’t believe it. Still on cloud 9. Thanks. She is always so happy. So funny. Oh I LOVE this post! The video of your little one snoring is hilarious ….that is quite the snore! Also love the smoothie recipe – I am trying to get my iron levels up so am looking new recipes and ideas – a breakfast smoothis involving spinach and kale sounds perfect! And I ADORE that little dress – very pretty! Thanks karen so much. I wish the dress came in my size. Lol I know I still can’t believe the snoring. Great for the 18th birthday lol hahaha yes do the smoothies. You don’t even taste the spinach and kale so it’s great. Congratulations on the nomination – really lovely to see an American expat on the list!! Very cute dress on Missy Moo – perfect little model. Thank you Gina so much. It’s a big honor to see my name on that list. It’s been a great first year for my blog. I never expected to even get shortlisted. Amazing. Do it’s so good for you. Even my kids love it. That dress is too cute, boys clothes are just never quite as adorable are they? Thanks for the congrats. I am so ecstatic. I know I wish the dress came in my size. No you are so right boys clothes are never never as good. I am so much more picky about Bubas clothes than missy moos. That dress is so cute. The more I see of the Little Bird range the more I love it. Thank you so much Lauren. I am still in shock. But thrilled. Yes I never had heard of it. Matter of fact I have never bought any clothes from Mothercare until now but it definitely won’t be my last. I love Made in Chelsea, and I love the Little Bird range, they do such lovely clothes fpr both boys and girls. Congrats on the BIBs shortlist too!